Although the iPad is really, really handy to have, turning pages while you play can be seriously annoying. Since the iPad only shows one page at a time, you have twice as many turns as you do with printed music and it takes some heavy-duty practice to get good this, especially if you’re a harpist and so can only use your left hand for page turns. 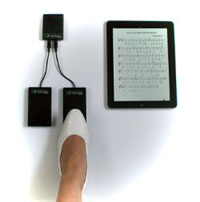 I was a bit ambivalent about the whole thing until AirTurn came out with their BT-105 unit, which provides a Bluetooth foot pedal for turning pages. The actual BT-105 is just a tad larger than your car remote, and you can hook up one pedal or two (one for forward, one for back). This makes all the difference in the world, let me tell you. You just tap the pedal to turn the page–no need to take your hands off the strings at all. They sell their own pedals (foot switches), which are very low profile and available in either black or clear. I have one of each, since I thought the clear one might be less obvious on a job but was worried that it might scratch more. I have to say that the black pedal isn’t really any more obtrusive, and so far neither has scratched, even on my sandy beach house floor. They also sell a much more bulky pedal made by BOSS, which they say is better for surfaces like spongy carpet and grass, but I can’t say I have any trouble with the slimmer pedal on either. The only downsides are that the pedal can be a tad clickety on uneven tile sometimes, and the iPad sees the AirTurn as an external Bluetooth keyboard, so you can’t use the onscreen keyboard till you turn off the AirTurn or disable Bluetooth. Also, it only works with apps whose developers have taken steps to ensure that it does. So while it’s dandy with forScore, the Musicnotes app doesn’t even know it’s there, and you can’t use it to avoid touching your iPad with messy fingers while using your cookbook app either. There’s a list of compatible apps on the AirTurn website. Although I have two pedals, I find that I mostly just use the one for forward turns and use in-score links for Da Capos and repeats rather than the back-turning pedal. If you’re a lever harpist the AirTurn is a complete no-brainer, but it’s considerably trickier if you play pedal harp. First of all, it’s hard to find a really good spot for it with all those pedals down there already, and it’s a good long reach to get to it, no matter where you put it. Personally, I find it extremely distracting when playing a complicated pedal piece I’ve known for years, but fine for things where my feet aren’t already completely set on what to do. Battery life is excellent. You can forget and leave it on for a couple of days and it still works. Airturn says 100 hours of standby time, but I’ve never really measured it. It’s a lot, anyway. The downside is that it only charges via USB. They suggest that a cellphone charger may fit the mini-USB port on the BT-105, but they must have different devices than I do. I couldn’t find a single mini-USB cable that fit exactly right. Still, the fact that the charge lasts so long means it’s not as much of an issue as it might otherwise be. If you’re going to use an iPad for music, you want one of these, no question. And that’s the only other problem: they can’t make them fast enough to keep up with demand, so you may have to wait a while after placing your order before it arrives. The BT-105 by itself is $79. Pedals are $30 each, available from their website. Now that you’ve got your iPad and your apps, you’ll definitely want a case to protect it while it’s on your stand. It’s a long way down if it should fall, and it’s a lot easier to handle the iPad when it’s in a case. There are literally thousands and thousands of cases/bags/skins/wraps, at just about any price point you want. A site like iLounge is a good place to get an idea of what all is out there. These are the two cases I have (a well-dressed iPad usually has a wardrobe, not just a single case), but you may well find something else that works better for you. Nobody loves this case ($39), but a whole lot of people use it. I’ve looked at lots of other cases, and while I totally understand and agree with the unenthusiasm it creates, I wound up going back to it for use in the house. Let’s start with the bad. The first thing that strikes most people about this case is that it feels pretty darned cheap for something from Apple. It’s true–it’s not at all the kind of quality I’d expect from them. The corners are sharp, which makes it kind of uncomfortable to hand hold until you figure out the technique. And the microfiberish surface attracts all sorts of gunk. In the first post in this series I mentioned how much I love just bringing one small clutch-sized bag on a job, so there’s no clutter to stow and no piles of stuff around the stand. In order to do that, there’s really only one case choice right now. Shortly after the iPad was first announced Happy Owl Studio announced that they would be producing this case ($80), which is a combination of a case and a clutch purse. It looked like the dream gig case–just remove the shoulder strap, open up the clutch, put on the stand and away you go. Nothing lurking around to stow, and no more having to worry about the security of a purse parked in a drawer miles away from where you are. Lots of people, including me, ordered them and waited for them to get into production. And waited. And waited. Finally, they began to trickle in just in the nick of time for Christmas. Was it worth the wait? Almost. You can see one all beautifully arranged on their website. Here's a candid of the inside of mine. Credit cards and drivers license. Antique cell phone (no reception where I live so it’s not worth having a smart phone). Virgin Mobile Mifi (for internet connection, since I have the wifi-only iPad). iPod Touch (for the cameras). Cable for tuner pickup (the pickup itself could also go, but my gig harp has a built-in pickup). Glasses (to see iPad screen, sigh). Square credit card reader in Square Snare. Microfiber lens cloth for cleaning iPad screen (these come in nice flat little cases). That’s a lot of stuff in in a very slim little bag, but it takes careful arranging to get it all in there without stressing out the zipper (if you do overload it, it’s a self-healing zipper, so you can just run the pull back over the separated area and the teeth will get back together). The iPad lives in its own compartment, so you don’t have to worry about scratching the screen. It’s almost the perfect case, but there are some flaws, some of them major. First of all, their quality control isn’t what it should be. I ordered two of these and the first one, a red limited edition with looser pleats which I gave away, was flawless. The second one, the blue one, has some issues. When I opened the box, instead of the nice new leather smell that accompanied the red one, there was an overpowering smell like auto paint. Fortunately this dissipated in a couple of days. Also, the construction was shoddier. There was lots of extra glue everywhere, even on the cute little metal owl logo on the snap. And the corners of the purse section had been pulled too tight so they were already bending away from the iPad side, making it look kind of tired before it had ever been used. More importantly, this means that it’s easier for stuff to get into the iPad side and possibly scratch the screen. The clips on the strap work very smoothly, so it’s not a chore to remove the strap when you put the iPad on your stand, but several people have reported having the D-rings on the case itself pull loose from the weight of the iPad because they’re not attached to anything stronger than the case leather. I haven’t had this problem, but then if I’m not on a job I usually take the strap off and treat the clutch as a big wallet and carry it in a purse. And I still see some minor stressing on the connection points. On the stand, from the audience perspective. And the performer's view. It fits perfectly. The purse side of it is really tight on space. There’s really not room for anything wider than its own strap. Even the iPad wall charger is pushing it. I’d like it a lot more if there were even another half inch of selvage on the zipper so that there was a bit more slack so I wouldn’t have to be so meticulous about putting things into it. You won’t get a set of harp strings in this case, incidentally. For me, since I mostly gig on a lever harp with a case that has a string pocket, this isn’t a big deal, but for a pedal harpist, it’s a consideration. You also won’t get even the tiniest hairbrush into it, and if you’ve got a long day where your makeup requirements involve full field artillery, it’s not so hot there, either. It comes in red, the blue that I have, and a nice musicianly black (which unfortunately is lined with a rather lurid purple, which is why I don’t have that one). During the long, long wait lots of us searched and searched for an alternative, but although there are thousands and thousands of different cases of all sizes and colors, this is the only one any of us could find that has a purse, a strap, and lets you leave the iPad in it while you use it. I’d love to see them refine the construction and get a better grip on their quality control for the iPad 2 version. Although it’s not heavy, it does add quite a bit of bulk to the iPad, which is why I prefer the slimmer Apple case when I don’t need to have everything at right at hand. If you’re a guy and you want something that won’t look like a murse, or if you just don’t like pleats, they also have a wallet which is the same thing in plain leather without the strap, but you can find a lot of alternatives if you forgo the strap. There are innumerable other case options if you don’t need the all-in-one business. You can even find a case that makes your iPad look like a nice antique book. Next time: No-hands page turns. This the fourth in a series on the iPad for classical/acoustic musicians. If you ever buy sheet music via download, you know Musicnotes.com, which is pretty much the only authorized source for a lot of the more current tunes. They do provide a free app for use with your purchases, which is fairly handy for you as the musician (no need to waste time scanning and saving as PDF), and handier still for the publishers (no unauthorized copying going on, no sir). The problem is that every time you open the app, you get the nifty coverflow-style view. It can’t remember where you were last time, and there’s not even an option to open to a simple list view, so it’s scroll city every time. Since Musicnotes wants you to use a unique app for their tunes, it ought at a bare minimum to stay where you left it the last time you closed it, since they’re making you switch apps to use other scores. For example, if I have a wedding where the bridesmaids are coming in to the Vivaldi Largo from ‘Winter’, that’s in forScore. But then if the bride is coming in to ‘Bittersweet Symphony’ by the Verve, that’s in the Musicnotes app, or at least they’d like it to be. Now that wouldn’t be a really big nuisance if I could get to it quickly enough (tap Home button, tap Musicnotes icon), but instead it’s tap Home button, tap Musicnotes app, scroll madly to find tune, tap tune. That’s a panic-inducing number of taps when you want a quick, smooth transition. You just tap the Menu button when you have an internet connection and you can choose to download any or all of the alternative key versions for a particular tune. Once they’re on the iPad you can still use them without a connection. If you play lever harp, as I mostly do, this is a wonderfully helpful feature, and it’s also great if you have to accompany soloists, no matter what instrument you play. Another very nice feature is that the first time you fire up the app and tell it to sync your tunes, it will automatically find every song you’ve ever bought from them. And in my case, some tunes I never did buy. As a harpist I’m 99.995% sure I never had occasion to purchase “Big Rock Candy Mountain” from them (or anyone else) for any reason whatever, but there it is in my song list, along with a few others I know I never bought. They also send out free tunes each month, a feature about which I’m kind of ambivalent. Mostly they’re not things I have much use for, at least not in their arrangements, but it’s a nice idea and once in a while there is something. Unfortunately, there’s no way to prune those from your main library. It’s show all or nothing for free tunes, which makes the main window even scrollier. And each time you purchase a new song and sync it to the iPad, the free ones all come back again. When you have an active internet connection you can purchase tunes right from within the app, which is nice, too, but overall I’d prefer they either fixed the app to make it more usable on a gig or else offered the option of downloading a PDF in the first place. Next time: Tuning with an iPad. Once you have your iPad, the next thing is to decide what app(s) you want to use for storing and organizing your sheet music. For the most part you want to have your music in PDF format, and a lot of people bumble along with one of the generic PDF readers like GoodReader or iBooks, but you’re really missing out on a lot of useful musician’s tools if you do that. You’ll find a slew of dedicated music readers in the App Store. My favorite is forScore ($4.99), so that’s what I’ll be talking about here, but there are others with somewhat similar feature sets, including Music Reader (free) and Unreal Book ($4.99). What’s great about these apps is that they are designed and built by musicians who created them for their own use, so a lot of thought has gone into making them work well, and development on them is continuing at a blazing rate–there were something like twenty updates to forScore last year, and the iPad didn’t even appear until April. If you buy music from musicnotes.com, they also have an app that makes it easy to get your purchases onto your iPad. More about that one in my next post. This is absolutely my all-time favorite iPad app. It’s a wonderfully competent organizer and reader for sheet music PDFs. You can organize your music in various ways (organizer, title, genre) and also create setlists of the tunes you plan to play on a particular job, if you like. You can add keywords and ratings and use those as search terms. You get all kinds of things, like a web browser, so you can just download a new tune right into forScore when someone requests it during the gig, as long as you can find it in PDF someplace on the internet (if you have a connection, of course). Normally you can add scores by emailing them or just by dropping them into forScore in iTunes on your computer. There’s a metronome which can be a regular click metronome, or you can set it to pulse the edges of the page if you want a visual guide. You can even set it to turn the pages of the score for you as you practice. You can share your scores with other musicians in your group via Bluetooth, if they also have forScore. You can set it to go from one tune in your setlist to the next just by turning the page, so you don’t have to go back into the menus again to get to the next piece. How it works: This shows where you touch to navigate. Tap or swipe in the right zone to go forwards, in the left zone to turn backwards, or touch the middle to bring up the controls. Margin adjustment. Use a slider to expand the view of a file so that the notes fill the available screen space. You can also pinch a page to enlarge it, but when you use the margin slider, forScore remembers them and keeps the score at that size. forScore also remembers where you left off last time, so the next time you launch forScore or the next time you go to a particular piece, you’re right where you were. Finally, the documentation never quite keeps up with the app itself. Given how quickly features are being added it’s not surprising, but it is sometimes annoying. forScore is far from unique in this, though, and it does have the best manual of any of the music reading apps I’ve found. To me, forScore is the single best app for sheet music viewing. There’s a lot of feature copying going on among all these competing apps, and this is a good thing for iPad owners, but to me the interface and organizational features of forScore make it the one to get. On the other hand, given how cheap the apps are, you should probably download several and see which one works best for you. You won’t go far wrong with any of them. So just what can the ipad do for you on a gig? Well, you can fit all the sheet music you could possibly want on the longest job on something you can easily hold in one hand, for one thing. And it can also replace your electronic tuner, stand light, watch, and calendar. It can help make sure you don’t get lost on the way to the gig. You can take credit cards from forgetful brides, so you don’t have to wait around while someone runs back to the room for the checkbook, without the hassle and expense of setting a merchant account. You can even include a book to read or a movie to watch on your break. Now the music is larger, but there's a lot less of it. So while this is useful when you’re practicing hard on a couple of measures, for most people sideways isn’t going to work so well on the gig. Another consideration is that you can only see one page at a time. If you play a single-line instrument where much of your music is only one page long this isn’t much of an issue, or even if you play a keyboard instrument where you can turn with either hand. But for harpists, (we can only turn pages with the left hand because of where the stand is placed relative to the harp), it’s something to think about. When glare happens. This is inside in a fairly dim room with bright sunshine outside the sliding doors. Reflected glare can be really, really bad with that shiny screen. I’ve tried several different anti-glare films on my iPad. They work great on the iPod, but even the best of them, the one from Power Support, isn’t enough of a help on the iPad. The glare just becomes more diffuse, but it’s still there. I wound up removing the film altogether, partly because the iPad seemed to run warmer with the film on it. You do get a little used to glare after a while, but I sure wouldn’t want to be sight-reading in a glare-ish location. Ironically, though, all those customers who can’t understand at all why a very expensive instrument needs to be out of the sun are invariably totally cooperative when I say, “But my iPad needs to be in the shade.” That they get immediately. I’ve never once had a client refuse to move me to the shade for the sake of the iPad, for all that they’ll always argue and roll their eyes about getting the harp itself out of the sun. Another point about the iPad is that it’s rather heavy for its size. You definitely want a good solid stand if you’re going to use it, rather than a cheap folding wire stand, or anything prone to twisting around when bumped. I love my Anderson music stand, but a plain old Manhasset should be fine, too, or any sturdy wooden stand. If you already have mic stands around, you can just get the iKlip or the GigEasy, but I don’t want to lug something as hefty as a mic stand everywhere I go. So while it’s far from ideal, I love having the iPad on a gig, with certain limitations. I don’t want to sightread music that size, even in ideal lighting conditions, for one thing, and I’m not crazy about it for ensemble scores with more than one cue line. But it’s definitely the future and it can be very, very convenient compared to lugging around twenty pounds of sheet music. And it’s wonderful to have all your music with you, so that when you’ve only been hired to play classical for the ceremony and they ask you afterwards to stay for the reception since the DJ didn’t show up, you can just tap your screen to break out the Bruno Mars or whatever. And I find that clients really like it that there’s no need to have the tunes bag and the purse and anything else that might be necessary cluttering up the floor nearby. I don’t think I’d buy an iPad today, though, especially not for use as a music reader. There are lots of rumors that the next version of the iPad, which is probably only a couple of months away at most, will be lighter weight and have a less shiny screen. There’s also a rumor that it will have a smaller bezel area, but I don’t believe that one. While the iPad would be absolutely perfect for music reading if you could expand the working area to include all that black space around the edges of the screen, losing the bezel width would be pretty annoying for a lot non-music uses. But it’s really all about the apps. Those are what make the iPad so pleasant to use. Next time, I’ll tell you about my favorite music organizing apps and about how to get sheet music onto the iPad. EDIT: Oh yeah, I forgot. A couple of people have emailed me to ask how long the iPad battery lasts. For me, it’s close to ten hours on one charge, as long as I turn off Push notifications, so it will get you through the longest day of gigging. This small clutch replaces everything in the photo above (and yes, the two images are to scale--check the tile lines). and let me tell you, when you also have haul a harp around, that makes a big ol’ difference. When things work out, the iPad is the best gig resource ever, but unfortunately there are some issues, too. In the next few days I’ll go over just how I use mine. I’m a harpist, and we have some special considerations (page turns are harder for us than for most instruments, for example), but even if you play flute or acoustic guitar or whatever, pretty nearly everything will apply and I hope be useful for you, too. Next time: The iPad itself: what’s hot and what’s not when you’re on a gig.